We have so many friends that live in Canada that we thought we would celebrate their country's day with them. So we selected a treat relevant to our North American neighbor. So of course we decided on of one of our fave foods - Canadian Bacon! Now let's wish all those that celebrate Happy Canada Day ! Hope its fab, ey? 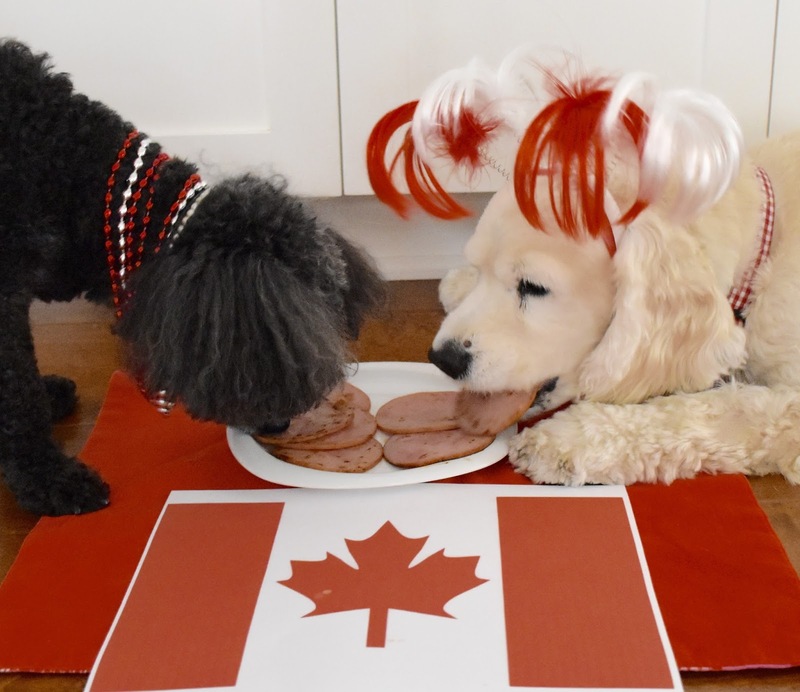 Yes, and we LOVE Canadian Bacon! Have a fab #FuzzFriday! RosyPoodleKisses! Oh yummy! That sounds like the perfect way to celebrate. Yes! It was totally yummy! Happy #FuzzFriday & Canada Day! RosyPoodleKisses! Yes! Canadian is one of my faves! I like it even better than regular bacon! Happy #FuzzFriday & Canada Day! RosyPoodleKisses! You both look so pretty! You're always dressed in just the right colors for whatever occasion you're celebrating. At first, we thought those were Annie's ears sticking up from her head...the better to keep them out of her way while she was eating. We had some bites of a ham and cheese sandwich for #FuzzFriday. It was just regular ham, but it was very tasty. Thanks! Sounds like you had a fab #FuzzFriday too! RosyPoodleKisses!